It was hard to get out of the bed after a horrible night in the bungalow. I went down to the riverside to catch a boat and a bus to the border. Then the formability at the border made me feel more sick again. The exit was a mess. The bus agency wanted us to give them our passports and pay 30 Dollar to manage the border cross. Normally it is 25 USD to enter Cambodia. 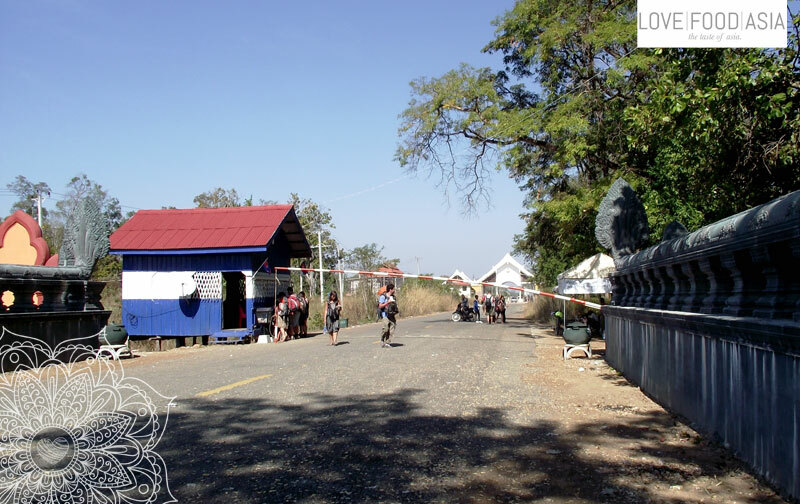 I kept my passport and together with 10 other travelers I was standing on the border to leave Laos. But the officials wanted us to pay 2 USD to let us go. We said that leaving Laos is free bus they played their game with us. They knew that we had to pay at the end because we had to get our bus. So at the end everyone paid 2 dollars or 20.000 kip and they let us go. Entering Cambodia was easy and we only hat to pay the official 25 Dollar. But the chaos wasn´t over jet. We had to wait for 2 hours to get the next bus. Departure time for Siem Reap should be after midnight and I decided to go to Phnom Penh first. I was running out of energy. So I arrived with 2-3 toilet stops at 11:30 pm in Phnom Penh. I shared a Tuk Tuk with 4 travelers to a hotel they recommended. Our driver was drunk as hell and he tried to bring as to another hotel but at the end we made it to the one the guys had recommended. I felt on my bed at 0:30 am. Finally!